There are a number of reasons why teeth lose their luster. 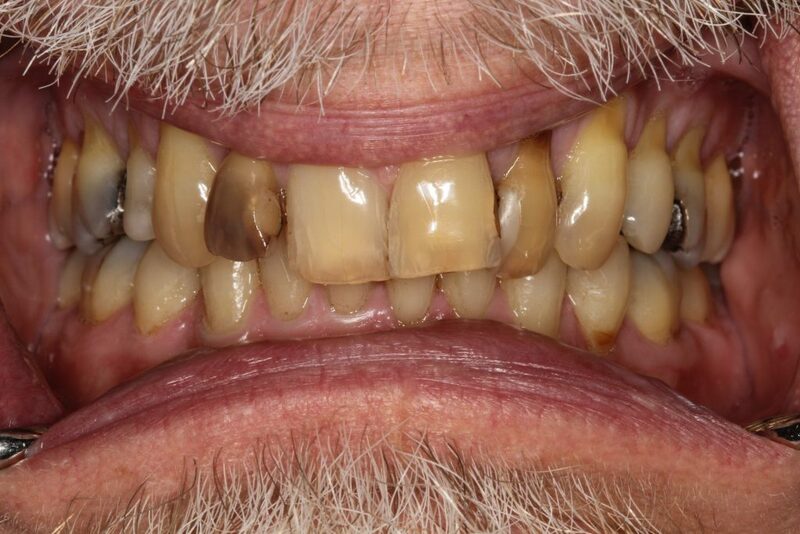 Smoking is perhaps one of the most common, followed by food and beverages that stain our teeth. Aside from these external factors, however, a tooth can undergo staining from within the tooth itself. Typically this is due to a structural defect within the tooth, a dying tooth, or because blood and other bodily fluids penetrated the tooth perhaps due to impact during a sporting incident or other trauma. 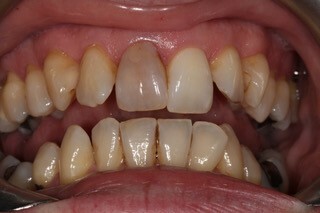 Regardless of the cause, whilst this staining can be covered by a crown or veneer, there are still opportunities to restore such a tooth to match the colour of its adjacent teeth, by bleaching the tooth from the inside-out – a process known as “internal” tooth bleaching. 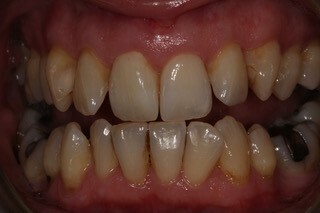 Unlike regular tooth bleaching techniques or whitening toothpastes that address discolouration on the surfaces of teeth, internal bleaching helps brighten and whiten teeth from the inside, by removing stains and darkening. 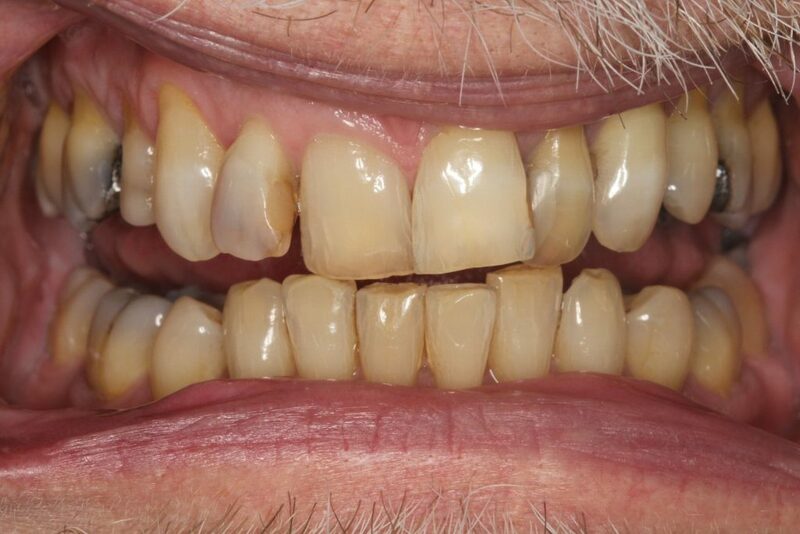 Instead of relying on an agent to penetrate to the areas where darkening and discolouration occurs, internal bleaching goes right to the source of the problem – the tooth’s interior – to reduce and eliminate staining where it occurs. Our Dr Vaughan has many examples of how this procedure can restore a tooth back to it’s natural colour, bringing your smile back to life. Once restored many people invest in external teeth whitening which will definitely have you smiling with confidence! 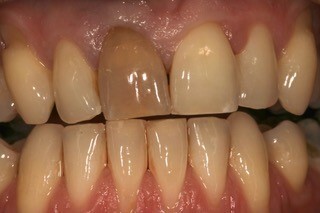 Before the procedure is performed, x-rays will be taken to evaluate the discoloration and assess the area of damage. To prepare the tooth, a root canal is performed first to remove diseased or damaged pulp. 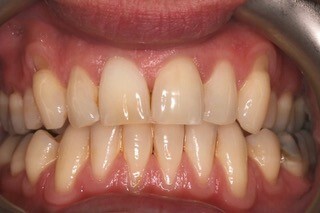 A special whitening paste is applied to the cavity, reacting with stains and dissolving them to help teeth appear whiter. 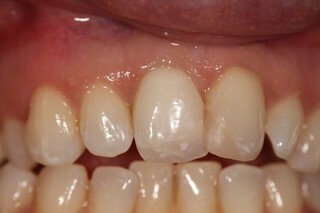 Once the canal is filled, the tooth is sealed to prevent further damage to the tooth’s interior. If a tooth already has a root canal and the root canal filling is sound, a hole can be made in the back of the tooth to enable the bleaching agent to reach the target area. After the access hole is made, the area above the filling will be carefully cleaned of debris and sealed to prevent the bleaching agent from reaching the filling. Then, the agent will be applied. 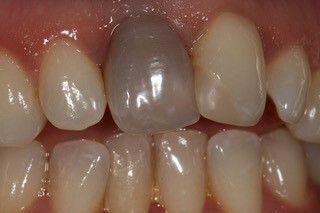 Once the desired level of whitening has been achieved, the access point will be carefully filled and sealed. Yes, the techniques and products used to whiten or bleach teeth internally are completely safe.